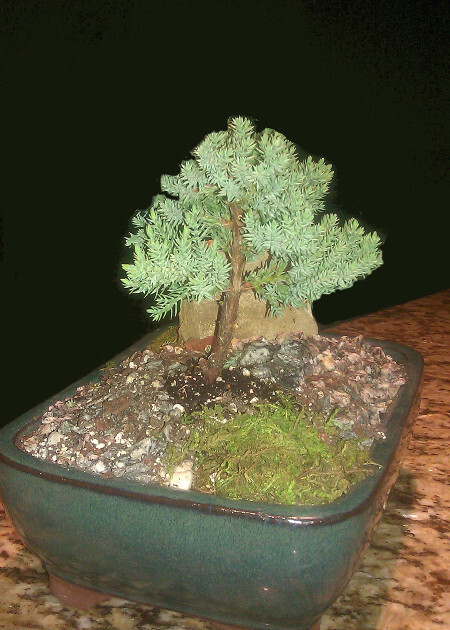 We are working on this bonsai and would like some expert advice. Should we cut more sub-branches? Is it ok if the main branch is bending towards one side? Or should we cut it to make it straight? Any other tips based on these pictures? 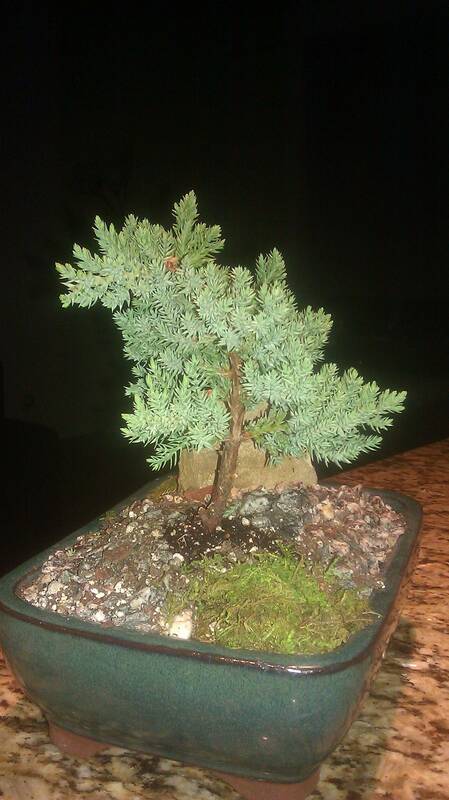 My suggestion is to begin by finding a picture of a bonsai that you would like to copy. You should find one with the same type, size and structure as the one you have. Regardless of the size of bonsai you have, the idea is to make it give the feeling of a tree in the wild. Just like art, it doesn't have to look exactly like a tree in the wild, it just has to convey the feeling. That being said, you need to be careful about lopping off lower branches as new branches tend to grow from above the trunk, if you remove branches too far down and you realise it was a mistake then you may be waiting a long time for another branch to grow back in its place. What I do is bend the branch I am considering removing behind the tree or cover it with my palm so I can get a feel for what the tree would look like without it before I make the big cut. Whether or not you want to remove sub branches really depends on the look you are trying to achieve. With this type of tree the top is very supple, it grows like a new branch and it is common to see this floppy top in trees that haven't been trimmed or trained yet. Because of this, you will quite often see this type of tree done in a cascade style. With older larger trees the trunk firms, usually straight as it gets older. I'm not saying this is you, but many people get sentimental about their first tree and this can often lead to rage or tears if something goes wrong with wiring or cutting. If you want to make art you need to break a few eggs. My local bonsai nursery (non-commercial, reasonably priced) sells starters for $3 each, I started learning by killing about 20 of these over a period of time. If you are still really attached to this plant then trim rather than cut. Trimming is where you take a pair of sharp scissors and remove minor branches and leaves to attain a desired shape. Cutting is where you prune branches and also remove minor branches to attain a desired shape. Larger size bonsai require regular cutting due new growth to maintain their shape. For smaller sized bonsai it may be preferred to only use the trimming approach because you are only dealing with thinner branches and it may look too sparse if you cut out any woody branches. There are several reasons why you would choose trimming for a smaller sized bonsai, but I don't have enough space here to go too detailed. To make things easy our reason is going to be because it is a small sized bonsai and because we don't want to make major cuts because you are still learning. You can always change your approach later by leaving the tree to grow out once you are more confident and then going for major shaping / cutting. Note, this goes against my previous suggestion of shaping this tree to be cascade style. If you would like information on how to make this tree into a cascade style I would appreciate you post a new question because it covers new ground and my answer would become too long as I need to go into pot choice and wiring etc. This section goes into how to use the trimming approach to improve the overall shape of this tree. Also please note that I am providing this advice based upon two pictures over the internet. Please keep your criticisms to yourself. I am providing one possible style and there are many ways you could do this. Before I shape any tree I typically decide which side would be the display side of the tree and then I would remove the tree from the pot, turn it until I was happy with the displaying side and then repot. Because I don't want to torment the tree I would disturb as little of the soil as possible, I don't want to trim / prune a tree on the same day I repot (replace the soil). I would then decide on the shape I would give the tree and then begin. When you are trimming or pruning a tree you usually will need to make the tree smaller than your desired size and then wait until it grows to the right shape. Why? Because you need to cut the tree to get the right shape and the right shape is always less than the current incorrect shape so you end up with a smaller tree than you started out with that now has the right structure to regrow in to a larger tree with the right shape. So you will notice from the picture below you have a tree with a new definite structure that will expand into a nice looking tree. As the tree grows you won't need to trim back to the smaller size, but trim to maintain the shape. Think of an expanding triangle, so you only need to trim the parts that grow outside of the triangle and let the tree slowly expand. This shape is very basic and will allow you to get a feel for trimming and you can watch to see how it regrows and trim to maintain or let it grow out and then experiment with other styles. Not the answer you're looking for? Browse other questions tagged bonsai cuttings dead-branch or ask your own question. How are Frangipani (Plumeria) cuttings taken successfully? 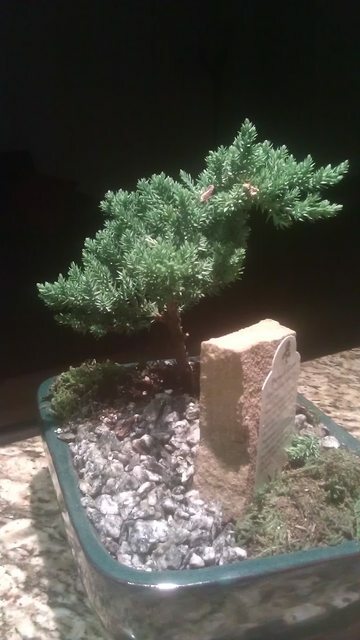 What can I do with a dead bonsai that was an anniversary gift?